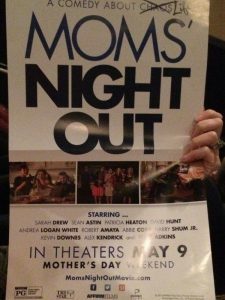 Last month a few friends were given the chance to go see the premiere of Mom’s Night Out, a movie starring Patricia Heaton, Sarah Drew, Sean Astin and Trace Adkins. It is about a group of 3 women who desperately need a break from their mommy jobs and take a night out for themselves. As you can imagine there are many pitfalls into their perfectly planned evening. Many are far fetched but definitely made us chuckle at times. The moms in the movies have new borns to teens so any age mother can truly relate to what they are going thru. There were many times that I could directly relate to what one of the moms was going thru, maybe it was not what I was dealing with at this time with my kids, but at some point of parenting. Mom’s Night Out Movie definitely touches on many aspects of motherhood and will give you all a good laugh and maybe even a tear. This is a wholesome movie that is suitable for any age group, including the kids but I do think the moms in your life would enjoy it more. Check it out at the movies today.